COMPANY PROFILE Whiting Petroleum Corp is a oil and gas company that acquires, exploits, develops and explores for crude oil, natural gas and natural gas liquids in the Rocky Mountain, Permian Basin, Mid-Continent, Gulf Coast and Michigan regions of the United States. Founded in 1980 and based in Denver, Whiting Petroleum is an independent oil and natural gas company with operations primarily in the Bakken-Three Forks system of North Dakota and Montana, the D-J Basin in Colorado, and the Permian Basin in Texas. At year-end 2015, proved reserves were 780 million barrels of oil equivalent with net production of 163,000 boe per day. Oil represented approximately 80% of reserves and production. 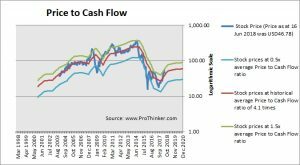 At the price of USD46.78 as at 16 Jun 2018, Whiting Petroleum Corp is trading at a Price to Cash Flow Ratio of 5.0 times last 12 months cash flow. 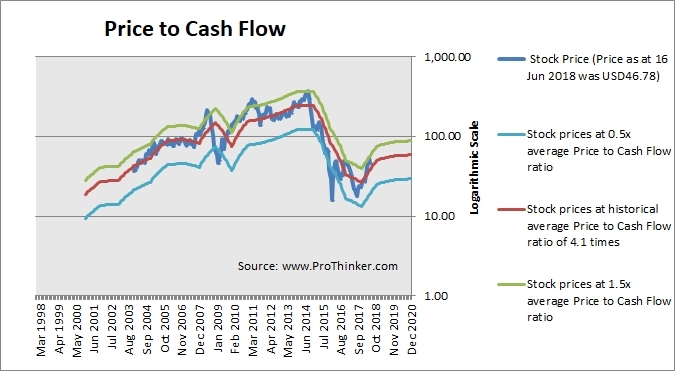 This is a 21.0% premium to its historical average Price to Cash Flow Ratio of 4.1 times.